Heat oven to 350°F. Spray cookie sheet with nonstick cooking spray. Remove dough from can. Cut loaf into 3 pieces; shape each into ball, placing seam at bottom so dough is smooth on top. Place dough balls, seam side down, on sprayed cookie sheet. Bake at 350°F. for 22 to 26 minutes or until golden brown. Meanwhile, in 2-quart saucepan, combine meatballs, bell pepper and onion stir-fry, and pasta sauce. Cook over medium heat for 10 to 15 minutes or until meatballs are thawed and thoroughly heated, stirring occasionally. Stir in Parmesan cheese until blended. With sharp knife, cut small portion off top of each loaf. Lightly press center of bread down to form bowls. Place each bread bowl on individual serving plate. Spoon meatball mixture over each. Sprinkle with mozzarella cheese and basil. Place top of each bread bowl on plate. To reduce calories and fat, look for light or reduced-calorie meatballs in the frozen foods section. 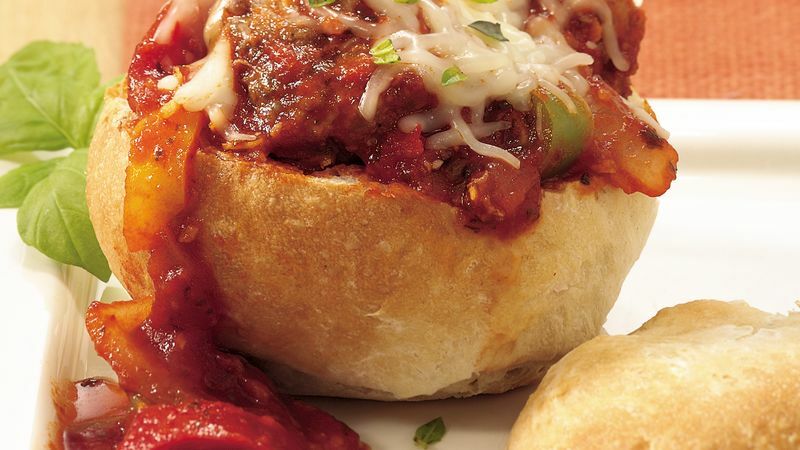 Serve pickle slices and your favorite homemade or deli coleslaw with these bread bowls.